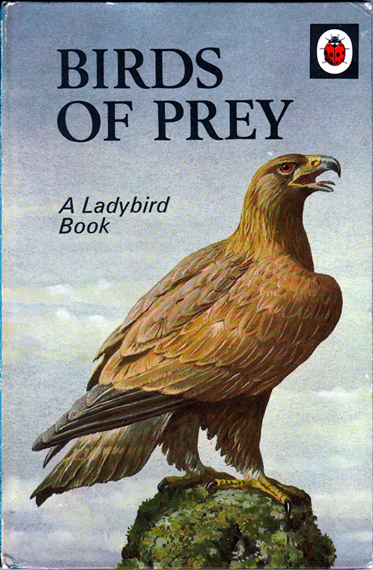 Description: "John Leigh-Pemberton's beautiful illustrations will help children—and adults—to identify any birds of prey they might see. The clear, interesting and reliable text will stimulate many people to take an even greater interest in bird life." Front pastedown and endpaper depict monochrome illustrations of various birds of prey, as they appear in flight when viewed from below. Rear pastedown contains information about the law regarding birds of prey, and warns the reader that they may face a "heavy fine…as high as £25" if caught taking or harming a rare bird or its egg. Matt pictorial boards are lightly worn. Spine and corners appear to be largely straight. Internally, the book is effectively as new. This reprint dates from 1974.